It is my birthday week and the family and I just got back from a trip to Las Vegas! I will blog about it later this week. I love going away but I am always so happy to return home. 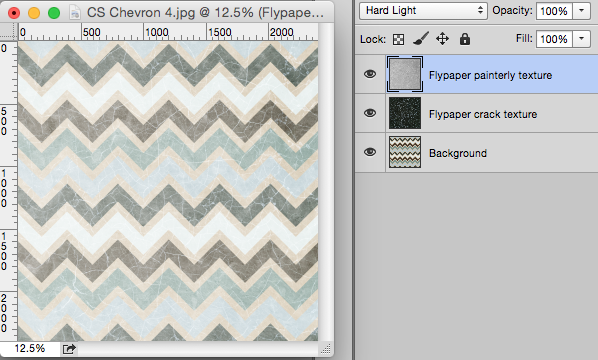 As I mentioned earlier, I have several layered graphic digital paper files that I can customize for my paper sets. I wanted to start sharing them all with you. 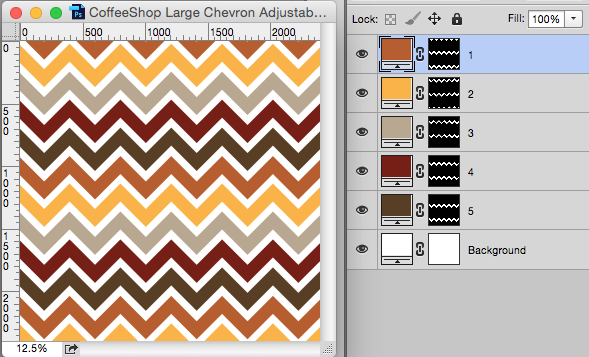 Today I have a new set of chevron digital paper that includes an adjustable layered .psd file where you can customize the colors and make your own paper sets for commercial or personal use. I also have another set of beautiful fall-inspired chevon papers here. I love using Design Seeds or my own Color Bar Deluxe action to pick colors for my papers. When you open the Photoshop .psd file you will see six layers. You can change each color by clicking on the Color Fill adjustment layer and using the eyedropper tool. You can also add textures to customize the papers. In this example I used two papers from Flypaper Textures, one cracked paint texture in screen blending mode and one painterly texture in hard light blending mode. Until the end of September you can get $5 off the new Fine Cracks Texture Pack by using the coupon code Cracking during checkout. 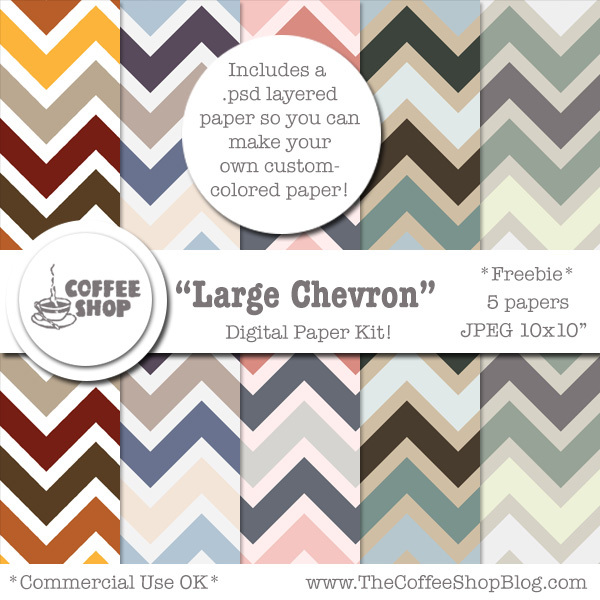 Download the CoffeeShop "Large Chevron" Paper Pack! You can also download it here. Yay! I love that I can customize the colors easily - thank you! You are so welcome Lora!!! Thanks Rita. I seem to be having an issue though. I opened it up to play around with it a bit and when I use the eyedropper tool to choose any colour, all I'm getting are shades of grey even if my colour choice is bright red or blue. When I switch to my own work, and use the eyedropper tool there is no problem--I get the full range of colour. Do you have any idea what the issue is? Any help when you get back on track after your birthday bash week would be appreciated. I hope you guys had fun in Las Vegas. Hi Lisa! I wish I knew what is going on. I opened the file in PSE 12 and Photoshop CC and tested it without any issues. It is RGB, 8 bit. Maybe you should reset your Photoshop preferences? Let me know if it continues to have issues. I am curious if anyone else is having problems with the colors.